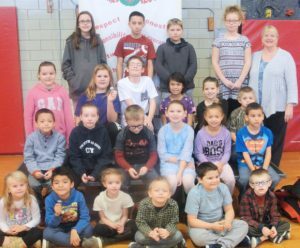 Fairgrieve Elementary School students show off their best smiles after they were awarded gratitude honors for the month of November. One students from each Fairgrieve Elementary School classroom was recently honored for exhibiting gratitude throughout the month of November. 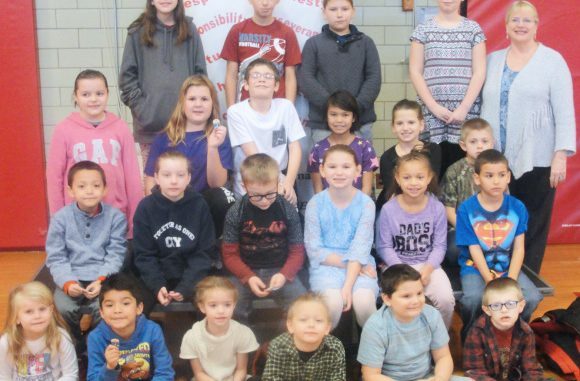 Recognized in front of their peers, guests and teachers, more than 20 students received praise for being thankful and having shown appreciation and kindness toward others in their classroom, special areas and school hallways. For their efforts, students received a “brag” tag” from Principal Jean Sampsell. Honorees in the front row, from left, are: April Marie Carter, Dilan Miranda, Madalynn Gardner, Carter Clark, Dominic Rellos and James Robinson. In the second row, from left, are: Travis Collins, Sophia Frataccia-Wavle, Wesely Foster, Cloee Diefenbacher, Ami Books and Amador Gonzalez-Ortiz. In the third row, from left, are: Josaphine Bach, Annie Quirk, Mikal Noble, Rose Douglas, HayLeigh Lenz and Donovan Oatman. In the back row, from left, are: Gianna Bach, Alex Belden, Ayden Cusic, Maria Ardizzone and Principal Sampsell. Absent are Christopher Smith and Astoria Reynolds.